Almost the entire US media joined them in condemning Trump for treason. Senate minority leader Charles Schumer said that Trump is controlled by Russia. And Trump’s Republican opponents led by senators Jeff Flake and John McCain attacked him as well. Trump allegedly committed treason when he refused to reject Putin’s denial of Russian interference in the US elections in 2016 and was diffident in relation to the US intelligence community’s determination that Russia did interfere in the elections. Trump walked back his statement from Helsinki at a press appearance at the White House Tuesday. But it is still difficult to understand what all the hullaballoo about the initial statement was about. As Daniel Greenfield noted at Frontpage magazine Tuesday, in succeeding years, Obama capitulated to Putin on anti-missile defense systems in Poland and the Czech Republic, on Ukraine, Georgia and Crimea. Obama gave Putin free rein in Syria and supported Russia’s alliance with Iran on its nuclear program and its efforts to save the Assad regime. He permitted Russian entities linked to the Kremlin to purchase a quarter of American uranium. And of course, Obama made no effort to end Russian meddling in the 2016 elections. So if Trump is Putin’s agent, what was Obama? Given the nature of Trump’s record, and the context in which he made his comments about Russian meddling in the 2016 elections, the question isn’t whether he did anything wrong. The question is why are his opponents accusing him of treason for behaving as one would expect a president to behave? What is going on? The Democrats and their allies in the media use the accusation that Trump is an agent of Russia as an elections strategy. Midterm elections are consistently marked with low voter turnout. So both parties devote most of their energies to rallying their base and motivating their most committed members to vote. The promise of impeachment for votes is too radical to serve as an official campaign strategy. 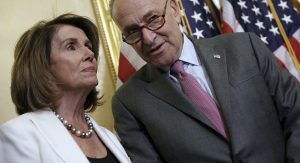 For the purpose of attracting swing voters and not scaring moderate Democrats away from the party and the polls, Democratic leaders Nancy Pelosi and Steny Hoyer say they have no interest in impeaching Trump. Impeachment talk, they insist, is a mere distraction. But by embracing Brennan’s claim of treason, Pelosi, Hoyer, Schumer and other top Democrats are winking and nodding to the progressive radicals now rising in their party. They are telling the Linda Sarsours and Cynthia Nixons of the party that they will impeach Trump if they win control of the House of Representatives. Consider, for instance, Europe’s treatment of Trump. Europe is economically dependent on trade with the US and strategically dependent on NATO. So why are the Europeans so open about their hatred of Trump and their rejection of his trade policies, his policy towards Iran and his insistence that they pay their fair share for their own defense? Why did EU Council President Donald Tusk attack Trump with such contempt and condescension in Brussels? Tusk, who chairs the meetings of EU leaders, is effectively the EU president. And the day before last week’s NATO conference he chided Trump for criticizing Europe’s low defense spending. That of course, was news to the countries of Asia, Africa, Latin America, Europe and the Middle East that depend on America and work diligently to develop and maintain strong ties to Washington. Leaving aside the ridiculousness of his remarks, where did Tusk get the idea that it is reasonable to speak so scornfully to an American president? Consider his relations with Putin. If there is anything to criticize about Trump’s summit with Putin it is that it came too late. It should have happened a year ago. That it happened this week speaks not to Trump’s eagerness to meet Putin but to the urgency of the hour. After securing control over the Deraa province along Syria’s border with Jordan last week, the Assad regime, supported by Iranian regime forces, Hezbollah forces and Shiite militia forces began its campaign to restore regime control over the Quneitra province along the Syrian border with Israel. As Prime Minister Binyamin Netanyahu and all government and military officials have stated clearly and consistently for years, Israel cannot accept Iranian presence in Syria. If Iran does not remove its forces from Syria generally and from southern Syria specifically, there will be war imminently between Israel, Iran and its Hezbollah, Shiite militia and Syrian regime allies. Israel prefers to fight that war sooner rather than later to prevent Iran and its allies from entrenching their positions in Syria and make victory more difficult. So, in the interest of preventing such a war, Trump had no choice but to bite the political bullet and sit down to discuss Syria face to face with Putin to try to come up with a deal that would see Russia push Iran and Hezbollah out of Syria. From what the two leaders said at their joint press conference it’s hard to know what was agreed to. But Netanyahu’s jubilant response indicates that some deal was reached. Certainly their statements were strong, unequivocal signals to Iran. When Trump said, “The United States will not allow Iran to benefit from our successful campaign against ISIS,” he signaled strongly that US forces in eastern Syria will support Israel in a war against Iran and its allied forces in Syria just as it fought with the Kurds and its other allies in Syria against ISIS. So far, unlike Obama’s foreign policy by this point in his presidency, none of Trump’s exchanges have brought disaster on America or its allies. To the contrary, America and its allies have much greater strategic maneuver room across a wide spectrum of threats and joint adversaries than they had when Obama left office.